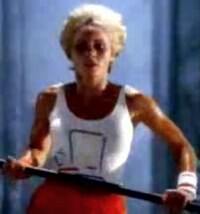 Written by Steve Hayden and Lee Clow, produced by Chiat/Day and directed by Ridley Scot with a budget of 900.000 USD the “1984” Macintosh spot was “officially” shown on 22 January 1984 during the third quarter of Super Bowl XVIII, a match between the Washington Redskins and theTampa Stadiums. The ad, which was then broadcast in a shortened 30 seconds version, borrowed the core of George Orwell’s novel “Nineteen Eighty-Four” and its dystopian future under a “Big Brother”, unanimously perceived as an allusion to IBM, Apple’s adversary on the market. Altough most sources mention the january date, the broadcasting history of the ad is actually quite rich and complex. Starting on 17 January it was screened prior to previews in movie theaters for a few weeks and before that, it was aired publicly on television on the night of 15 December 1983 by KMVT in Idaho. This was a clever move by the advertising agency, Chiat/Day, so that “1984” could be submitted to award ceremonies for that year. Before that, on the 20th of October 1983, Ridley Scott’s visionary masterpiece promoting the Mac was shown during Apple’s annual sales conference in Honolulu to “a rapturous reception, almost as apocalyptic as the commercial itself”.